when a sale is complete, a broker earns a commission based on a percentage of the purchase price. If you are interested in a career in real estate, the first step is choosing the type of agent you want to be so you can focus your education appropriately. If you will be primarily selling residential properties, then consider whether a broker or an agent is the right title for you. Understanding the difference will help you make the right choice. A residential real estate broker works as a real estate agent. 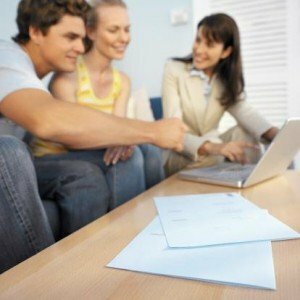 They help people with the purchase and sale of property. However, they are slightly different than salespeople. Salespeople also work as real estate agents, but brokers are higher in the hierarchy of the real estate world. They typically supervise real estate sales agents who work under them as part of a brokerage firm. They have further training and experience than sales agents. Residential real estate brokers work with people buying and selling homes, not commercial properties. They will work with buyers and sellers to negotiation purchase prices, complete all necessary legal paperwork and close the actual sale. They will also market properties for sellers and assist buyers in seeing properties they are interested in. when a sale is complete, a broker earns a commission based on a percentage of the purchase price. The primary requirement for residential real estate brokers is passing the broker’s exam, which earns them the real estate broker license. While each state will have slightly different rules and regulations as to how that exam is passed, the end result, which is the license, is the same. These licenses are not transferable from one state to the next, but some states do have reciprocity programs in place. A real estate broker typically will have a degree in real estate, but a degree may not be required if the broker has real estate sales experience and some real estate coursework. Again, each state will have its own specific requirements in place for its real estate brokers. A real estate broker can follow one of two basic career paths According to the National Association of Realtors. First, the broker can complete a four-year degree in real estate. That degree will cover real estate best practices, real estate law and marketing. Upon graduation, the candidate will have to pass the broker’s exam. A second path involves two years as a licensed sales agent, then completion of some college-level course work at a real estate school. After completing the course work, the candidate will again have to pass the broker’s exam. Finally, if you are part of the legal bar for your state and is able to pass the broker’s exam, you may be granted a broker’s license without taking additional coursework. Because of their greater job experience and training, and therefore greater qualifications, brokers tend to close more profitable deals than sales agents. As a result, they have a slightly higher level of compensation. The Bureau of Labor Statistics indicates that real estate brokers earn an average of $54,910 as of May of 2010. The top 10 percent of wage earners earned over $161,820, while the bottom 10 percent earned less than $25,550. Compensation is based entirely on the current market trends, and as a result those in markets with higher property values will earn more than those in struggling markets or markets with low property values. Growth for real estate brokers is slightly slower than growth for all careers as a whole. The Bureau of Labor Statistics indicates an expected job growth of 11 percent between 2010 and 2020 for agents and brokers combined. If a career in real estate seems interesting to you, finding the right coursework is the first step. We are ready to help.